The Calendar app shows all events across all of your conversations in a traditional calendar view. Within each conversation stream, you can see upcoming events in the right pane, but the Calendar app lets you view your entire schedule. Click on any event or task on the calendar and its Details view will slide in over the right pane (as depicted below). You can view all of the event or task's details here, see its history, and add replies. • View all events, just events that you posted, events posted by a selected person, or events from a specific team/team folder. • Display the calendar in day, week or month view. • Show tasks with due dates on the calendar. Under the gear menu are options to show or hide weekend days, and to change the start day of the week from Sunday to Monday. NOTE: Events posted to a team or group are displayed in that team or group's color if one was specified. 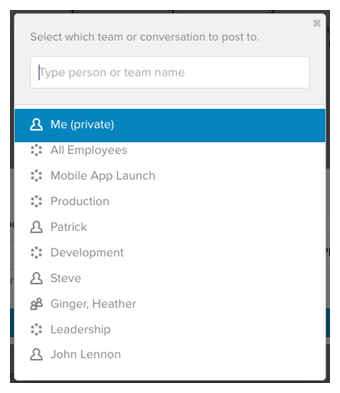 Click on the gear button in the heading of a team to set its color. Add an event to the calendar by clicking on the New Event button at the top of the page or click anywhere on the calendar itself. You can also click while pressing the Command key on Mac or Alt key on Windows to create a new task with a due date on the given day. The form for creating an event here is identical to that when posting from a conversation stream. Click on the more link to specify a location and description for the event. Unless you have the calendar filtered to show just events from a specific team, you'll notice that the green button just says Post Event and doesn't refer to a specific team. When you go to post the event, you'll be asked to select the conversation to which it should be posted. NOTE: One of your options is the Me conversation, which allows you to post events that can't be seen by anyone else. You can drag events around the calendar to change their dates and for multi-day events, you can drag the event’s border to increase or decrease its duration. QUICK TIP: You can have events from your RingCentral App calendar, as well as any tasks with due dates, appear in your calendar application of choice (e.g., Google Calendar, iCal, Outlook, etc.) by subscribing to your RingCentral App’s calendar feed. To do this, click on Integrations on the left pane > Calendar and then, look for the URL for your calendar feed.